MIRALUX FIDUCIARIA offers the possibility to choose between an extensive offer choice, which depends to a major extent on the answer to the preliminary and main question which the customer must ask himself: do I really have a strong wish to turn my attention to Switzerland and to work being settled in this country? After the comprehensive evaluation of situation in all European countries and if necessary, of the entire world, one can easily come to a conclusion that none of the country can offer the businessman as many possibilities as Switzerland, and in particular the Canton Ticino, can. The Canton Ticino presents a unique chance, being a kind of a microcosm which can not be found in any other part of the globe. Here you can find very efficient services, disposed in close vicinity, the commodity of the transport network, etc. which attract many foreing businessmen who select the Ticino as the privileged place of their residence and professional activity. The first way is to constitute a company with the aim to live in Switzerland and to run it on site. Another possibility consists in transferring the part of the acting company via a company with a centre and legal address in Switzerland, which can dispose the chattel or immovable property, bank accounts, etc. both in Switzerland and in a foreign country. There are various types of companies. Some customers apply to us only for the destined companies which are engaged in buying and selling activity, managed from the foreign country through the third persons who can be traders, lawyers, persons empowered to act for the other person, etc. Anyhow, we have also created the reliable and appropriate trading companies, on the base of which their directors got the possibility of getting the residence permit in Switzerland. Types of the companies available. The Helvetia companies can be constituted and registered in order to run the trading, to make the real estate investments, corporate holdings, to provide services on management and consulting, financial transactions, and any other asset which is consistent with the Swiss legislation. The basic law determines comprehensively the purpose, the share capital and the modalities with which the company works. It should be also taken into account that in accordance with the Swiss legislation related to corporation (=Spa), the majority of the administrative board members must possess the Swiss passport and have the address in Switzerland. For this reason, the foreign customers entrust us generally with the task of representing them in the board of directors in their stead to commerce circles, lawyers, persons of confidence. Concerning the limited liability company (=Srl), it is enough that one of the managers is domiciled in Switzerland, also being a foreign citizen. Our company is in any case in a position to assist the customers also under this profile, finding the legal person, who functions as a administrator or managing director. This type of company must be constituted with a least property of CHF. 100'000.--, and at least Fr. 50'000. -- capital should become in bearer shares or registered shares divides. In order to constitute the company, it needs at least three shareholders of any nationality and it can be either the legal persons or natural persons. The administrative council must be constituted only from an administrator, who must be the Swiss citizen with the place of residence in Switzerland, or from an administrative council, composed from more members, the majority of whom must have the Swiss passport and the place of residence in Switzerland. The company must obligatorily subjected to the yearly independent audit and financial accounting which is in accordance with legislation. 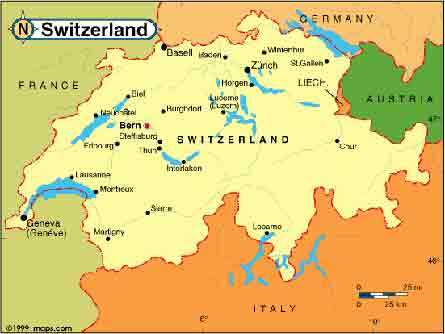 The assemblies of the shareholders must be held in Switzerland as well as also the administrative board sessions. To the dividends, which are granted to the shareholders, the state levies a tax, called settlement tax of 35 %, which can be regained in case of availability of the relevant Swiss conventions with various foreign states signed there, to avoid a double taxation. This type of firm is very similar to the corporation, because this consists of a legal person with a capital. However, it does not have shares, but the so-called social quotas, the holders of which are enrolled in the Registry of Commerce. In this sense the GmbH (Sagl) does not guarantee the anonymity of its holders, while in that case of the corporation (AG) this condition is guaranteed just like that with the establishment of a firm with the share capital, consisting of bearer shares. The owners are recorded in the trade register, and the shares of GmbH (Sagl), can nevertheless hold the interests of a legal or natural person in the trust, so that the anonymity from the party entitled on the interests is guaranteed. GmbH (Sagl), in contrast to AG (SA), needs this for this no audit revision, so that the administrative costs of this company are lower opposite AG. The necessary, minimal share capital amounts 20'000. - Swiss Francs and this is in interests from at least Fr. 1'0000. - divided. The holders, enrolled in the Registry of Commerce, of the social quotas of Sagl, can however stop the fiduciary quotas mind for another physical and/or legal person, and in such way to straight guarantee for the anonymity of having the interest of the quotas. The Sagl, contrarily to Ldt., does not need the revision audit, which means that the operating costs of this last company are generally less regarding those of Ldt. Thus, the necessary share minimum equals Swiss francs 20'000.-- and the same quantity is subdivided in quotas at least Fr. 1'000.-- each. Attention: the pricies are in Swiss Francs. MIRALUX FIDUCIARIA is in a position to supply the corporation and the companies with the limited guarantee, to competitive prices and with maximum discretion. The recording process takes usually about 7 working days. REGISTRATION EXPENSES FOR A SWISS FIRM LtD. However, one must realize that the opening of the bank currency account and the bookkeeping guidance must be paid separately. This depends on the commercial range of the firm. The year expenses usually amount for a management of AG or GmbH between 5'000. - and 15'000.-- francs approximately, this means a reasonable sum if one considers the quality of the above proficient service, and on the basis of these companies the client gets the possibly to have an approval to live and to work in Switzerland. The Swiss firms have a very good reputation in the whole world, for one reason more, because they are always properly advertised. These are also integrated in a sure economic and social system which can be easly manifested in future, and immediate tax-political or economic changes are hardly to be expected.